Iceland nails ad virality - what can we expect from John Lewis? November 14, 2018, 10:09 a.m.
John Lewis’ Christmas adverts always provoke a huge reaction – generating the sort of headlines and cut-through that are the envy of marketers and company bosses everywhere. However, as we await this year’s effort, it is worth looking back to last year’s ‘Moz the Monster’ campaign. 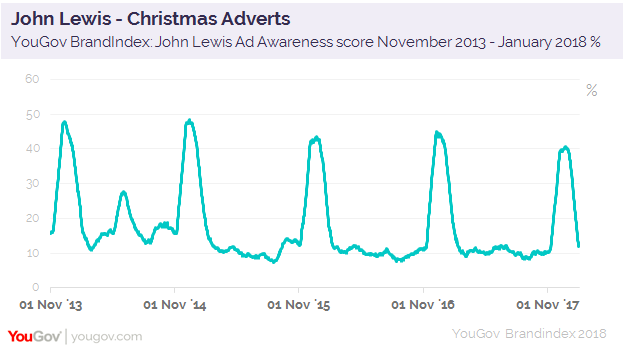 YouGov BrandIndex data from Christmas 2017 showed that while the advert performed extremely well, it didn’t quite match up to previous efforts. Our figures show that John Lewis’ Ad Awareness score achieved a high of 41% during last year’s Christmas period. This compares to the score of 48% that was achieved during 2014’s Monty the Penguin campaign. This may suggest the public is starting to become desensitised to the charm of the genre adopted by John Lewis in its campaigns. Whether this year’s spot is a marked change remains to be seen. 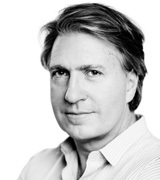 Of course, this year’s ad comes at a challenging time for the brand and the high-street sector as a whole. As always there is fierce competition from brands across a variety of sectors. Aldi has chosen to reprise its Kevin the Carrot character, while Heathrow once again features its ‘Bair’ family. Meanwhile, Iceland has made headlines following a decision to ban the supermarket’s effort from television. The campaign, which is a rebadged Greenpeace film, features an adorable orangutan, and takes aim at deforestation to create palm oil, which is destroying the creature’s habitat. YouGov’s Social Voice of Brands report indicates that more than half (52%) of people in Britain think that brands should be able to express how they feel on a certain topic. Four in ten (42%) like brands that are willing to get involved in social issues. The advert has been shared widely on social media since news of the ban emerged. And while the television ban may hurt overall ad recall, the fact Iceland has done something different in its campaign may well help to separate it from the glut of brands trying to garner attention this festive season.